Merry Christmas to you too, Brenda. I hope the forthcoming year brings you better health, and lots of flowers. have a wonderful cozy Christmas Brenda! in that little cozy house with dearest Abi and Charlie! Merry Christmas. Love the card! That's a great piece of artwork. 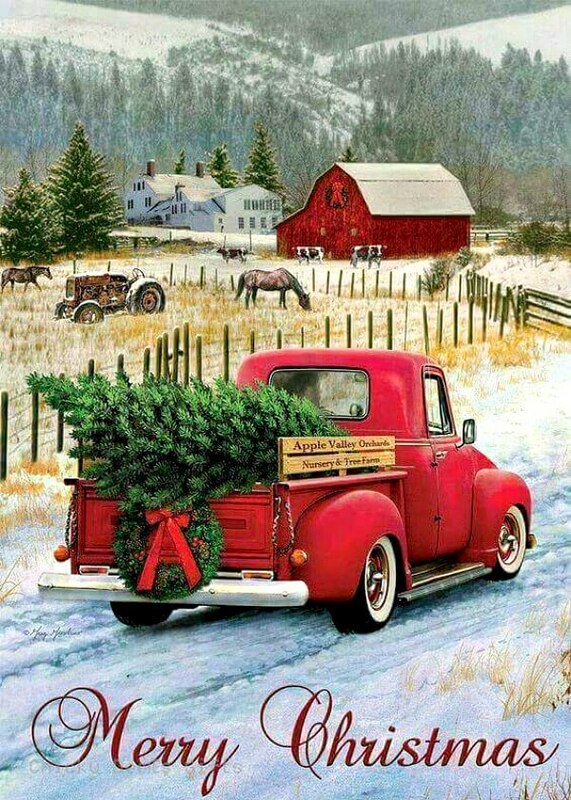 The barn, the truck with the tree, the snow-covered fields.The touch of a by-gone era. For me, it evokes a sense of simplicity and contentment. I enjoy your blog and the sharing of your life and tho'ts with us all through the year. Wishing you joy and health this Christmas day and looking forward to the next year's posts. Be well, Brenda! And the pupsters, of course! I hope you had a fabulous and peaceful Christmas with the pupsters, Brenda! I don't get to read every post, but I always enjoy a visit with you! Happy New Year!